Our Identification decals are made of 2 mil embossable self-adhesive aluminum. They are designed to write on with a ballpoint pen for tamper-resistant identification such as inspection and installation dates. The image is printed using screen process printing sometimes called "silk screen." We use the highest quality exterior enamel screen ink for the longest outdoor life. Just peel, stick and write with a ballpoint pen. They can also be typed on or stamped with serial numbers. Ask us for a no-obligation sample if there's any question of it's suitability for a particular application. The decals are natural aluminum color with highest quality solvent screen-printed enamel. For Sequential numbered Aluminum Decals, click here. 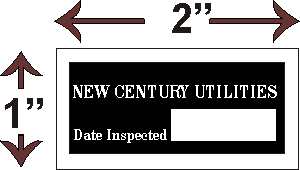 Our Electric Meter Legal Notice tags are made of 2 mil embossable self-adhesive aluminum. The image is printed using screen process printing sometimes called "silk screen." We use the highest quality exterior enamel screen ink for the longest outdoor life.